Sitting at my desk yesterday, I was dumbfounded to see a hawk flying straight at me, at eye level, just over the top of my computer. I had a momentary sense that I was in the world of Harry Potter and owls were filling the air. But as the bird got closer, I could see that it was a juvenile hawk and it was alone. By chance my camera sat next to me. Well, let me correct. Not “by chance” did my camera sit next to me. I have actually been trying to remember to set the camera up, lens cap removed and all-purpose settings set on the outside chance something this way cometh. Yesterday my preparation paid off. 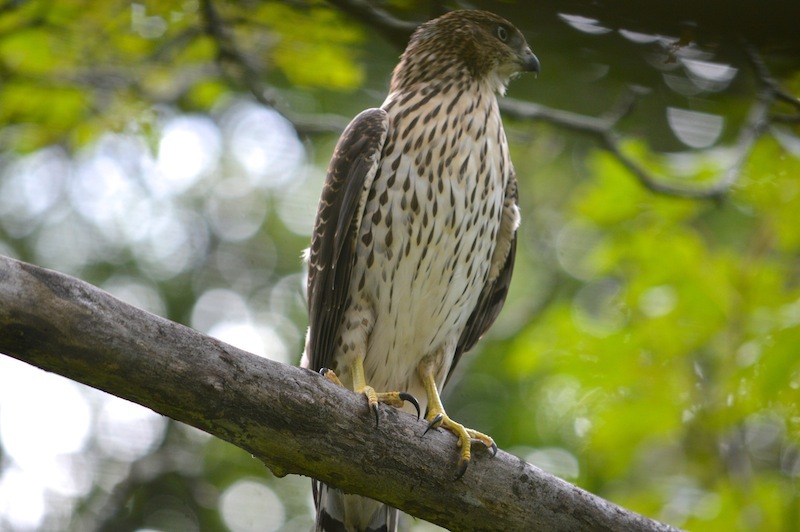 When the hawk was just ten feet from the window, it glided smoothly to a branch about ten feet off the ground. To my eye, the hawk was now blocked by the eves of the house. So, s-l-o-w-l-y I brought the camera to my eye and put my cheek nearly on top of the desk. I think now I must have gingerly closed my laptop computer. With much awkwardness I contorted as low as I could and began to shoot photos of the bird. I knew the hawk would not perch there long and that any move I made was likely to scare it off. We weren’t more than ten feet from one another. Throughout this post are four shots I got. I finally did scare it off as I tried to turn my camera to get a portrait shot that would include both the head and the tail in one frame. I was disappointed to not get that shot. But whether I turned the camera or adjusted the focus length, I was sure to send the bird on its way. Truthfully, I’m happy as can be with these photos. The talons are menacing but the delicate droplet-shaped markings on the chest are beautiful. 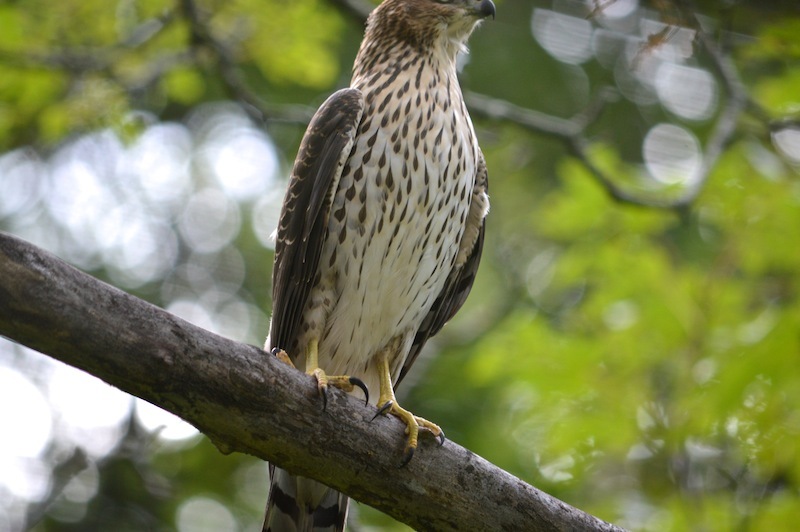 I think this is a juvenile Cooper’s Hawk. Please feel free to correct me. Stunning photos. I adore birds of prey. You might like my post on the British Wildlife Centre. Take care. Emma. What a great experience you wrote about! Here’s the link so others can enjoy it too! What a beauty! I haven’t had the chance to see one of these yet. According to Cornell’s eBird sightings, a few people have spotted one in my area; so I’m crossing my fingers to get a glimpse. I did happen to see a Black Vulture the other day in my back yard that took me by surprise. Thanks, Patricia! I love the photo, and I think it’s a Cooper’s hawk. 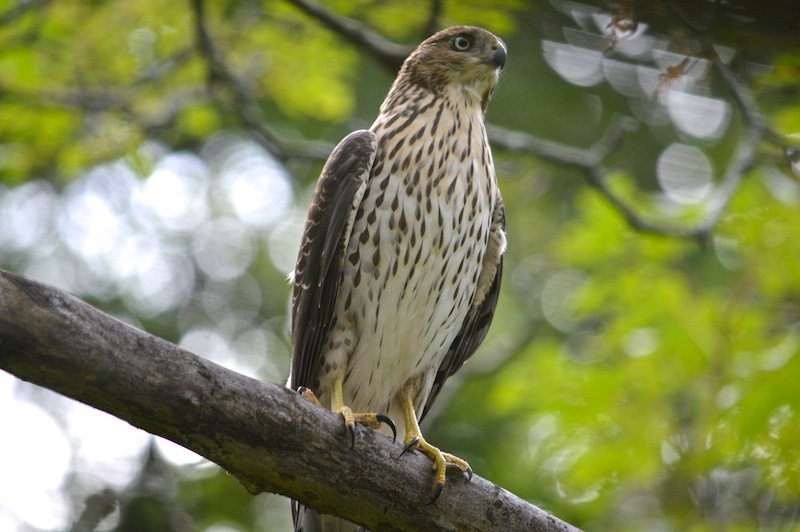 It’s that or a Sharp-shinned hawk. They are hard to tell apart and I’m far from expert! Glad you enjoyed the photos!